Fast food is an integral part of our society, from the hot biscuit sandwiches and hash brown patties for breakfast to the burgers, fries and shakes of a quick dinner. Because it is relatively inexpensive, quickly prepared and easy to eat on the go, fast food is the ultimate culinary convenience, but that accessibility can lead to dangers that may impact a person's health, quality of life and budget. With the many regulatory agencies that monitor fast food restaurants, consumers often wonder why they are dangerous at all. The Food and Drug Administration, state and federal inspection boards and other quality control agencies exist to ensure that fast food is not detrimental. Unfortunately, there are many potentially dangerous factors that agencies cannot patrol continuously. The extremely high volume of food that restaurants handle can spread dangers faster than the drive thru, and the high employee turnover rates mandate continuous training that may not be effectively absorbed by new workers eager to begin earning their paychecks. Savvy consumers, on the other hand, can reduce the risks of unhealthy fast food by understanding what dangers may exist and how to avoid or reduce the problems. 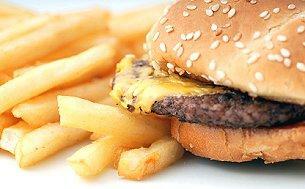 Food poisoning is one of today's most visible fast food scares. Several times a year, the media will report on outbreaks of different food-borne illnesses with symptoms such as nausea, fever, diarrhea, cramps and dehydration. These outbreaks may affect just a few individuals or may spread to hundreds, and may even result in fatalities. Food poisoning has two common causes: unsanitary cooking conditions and improperly cooked food. Bacteria thrives in unclean facilities and can quickly spread between the temperatures of 40 degrees and 140 degrees Fahrenheit, which is why most health food inspectors emphasize the necessity for proper sanitation procedures and the right internal food temperatures for fried and grilled foods. While restaurant patrons may not be able to bring a thermometer to test their meat or create laboratory cultures for countertop bacteria, simple observation can help consumers avoid this notorious fast food danger. Go inside the restaurant to check for general cleanliness. An unclean restaurant (dirty floors and tables, unsanitary restrooms, unpleasant smells, etc.) may indicate a greater likelihood of dangerously unclean cooking conditions. Employees should be dressed properly (including hair nets, gloves, and other protective clothing when necessary), have clean hands and fingernails, and be attentive to their jobs. If the employees don't care about how they look or act in front of customers, how can they care about the food they cook and serve? Wash your hands before eating. Many suspected cases of food poisoning are caused by the patrons rather than the food itself. Keep anti-bacterial foams, gels, or wipes available before eating drive thru meals and be sure to wash thoroughly before handling any food. Eat food while still hot. Once food cools, bacteria can multiply at an extraordinary rate. Do not order fast food meals and then drive home for a half hour before eating. If a delay is inevitable, reheat the food to a safe temperature before eating. Reserve fast food meals for a treat rather than a convenience. Skip requesting larger sizes that add more to the bill. Use coupons and special deals to enjoy the treat at a lower cost. Fast food dangers come in several forms, but health- and budget-conscious consumers can easily avoid the most dangerous traps of the fast food industry with common sense and moderation. A quick and convenient treat from the drive thru is nothing to be afraid of if it is enjoyed wisely.